In an ideal site for families on a large plot of 1500 m2, our lodging of 9 persons of 110 m2 welcomes you. Furnished detached house with, on the ground floor, kitchen open to living room, living room with a wood stove (pellets), 2 bedrooms, 1 bathroom and wc, upstairs, 2 bedrooms, 1 bathroom toilet. 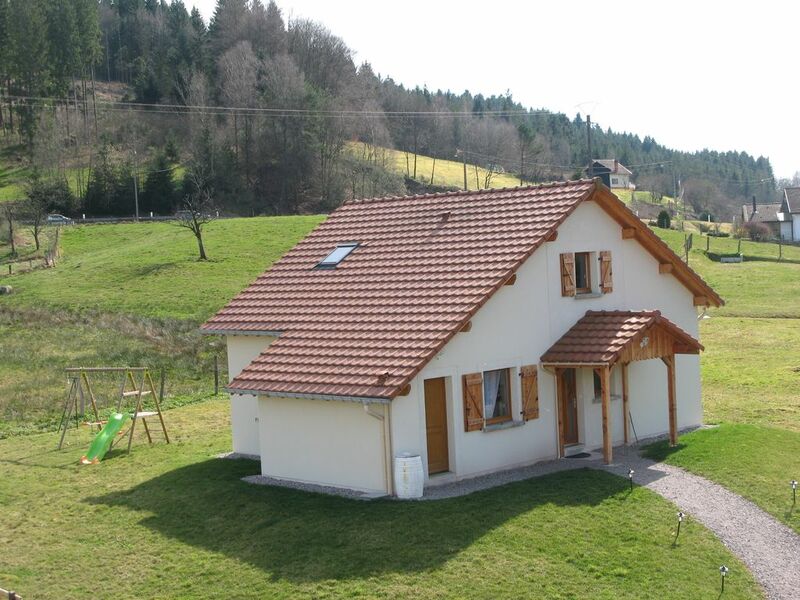 Inside, comfort is there: raclette, TV, DVD player, dishwasher, washing machine, dryer, ... Bedding made in the Vosges. Charges included (water, electricity, heating). Outside, terrace, barcecue. Nearby, in the charming village of Julienrupt: bakery, butcher, restaurant, adventure park for children, greenway 5 km. Leaving the house, walks, mountain biking. The baths in Plombières les Bains. Cross country skiing and downhill at 15 kms (GERARDMER) and at 30 km (La Bresse). We booked the house for a family gathering with family members travelling from different countries to attend a wedding in the neighbourhood. The house really exceeded our expectations and comfortably accommodated eight of us for two weeks. Although we were all adults the house would be equally suitable for families with children. Its is a modern house in a traditional style, deceptively spacious, and maintained as if new. The house is fully equipped with modern appliances and lacks nothing obvious. The views from the house along the Clurie Valley are wonderful and there are some interesting woodland walks along the valley that can be started from the house. There is a patio at the rear which we used almost every day for breakfast and other meals whilst enjoying the beautiful views. The owners live in the house next door and we're very friendly and helpful, they have provided games and pastimes for inside and outdoors, and lot brochures and information about local attractions including maps and walking guides. We would not hesitate to recommend this property to friends and family or in fact anybody who wishes to a few days in the region. We appreciated the exchanges with our Irish hosts: very warm, cheerful and nice. It is with pleasure that we shall welcome them again ! Je tiens à remercier Mr et Me Pierrat pour leur accueil et leur gentillesse et à les féliciter pour la beauté et l' efficacité de leur gite. La position du gite est excellente pour arriver à plusieurs destinations en un minimum de temps,de plus on trouve tout commerce à proximité. Nous avons séjourné pour un week-end « Chez Toinette » et tout le monde (grands parents, parents et enfants) a été ravi. Le chalet est très agréable et très bien équipé. En outre les propriétaires sont très gentils et particulièrement à l’écoute. La station de ski se trouve à 30 minutes maximum ce qui reste raisonnable compte tenu du rapport prix/prestations. Nous avons été ravis de séjourner à 8 dans ce gîte. Très fonctionnel, très bien équipé. De nombreuses informations disponibles pour visiter les alentours avec les conseils du propriétaire. C'est une adresse que nous gardons! tolle Einrichtung , neue moderne Bäder (2) schöne Möglichkeiten zur Erholung (Ruhe, wandern und jetzt im Sommer das viele Grün, satte Wiesen mit Kühen) Die Anreise war etwas schwierig, da unser Navi die Straße nicht gefunden hat. Ein gute Hinweis ist das Schild "Lecleurie" das leitet auf die richtige Straßenseite. Wer viel Aktion will ist dort nicht gut aufgehoben, dafür gibt es umso mehr Ruhe!